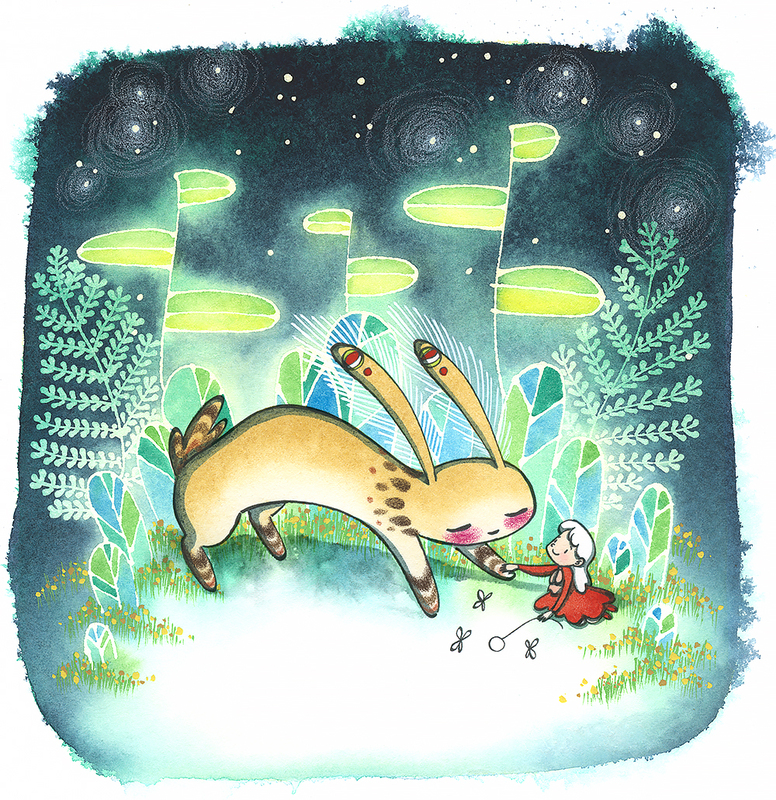 This month we feature Austin SCBWI member Marsha Riti, a talented illustrator who recently won the top spot in the 2014 Austin SCBWI Conference Portfolio Showcase Contest and designed the banner currently displayed on the Austin SCBWI web site. 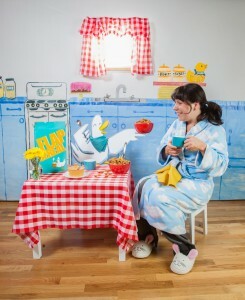 And if that isn't enough, she's cool enough to eat cereal with a duck (see illustration above)! 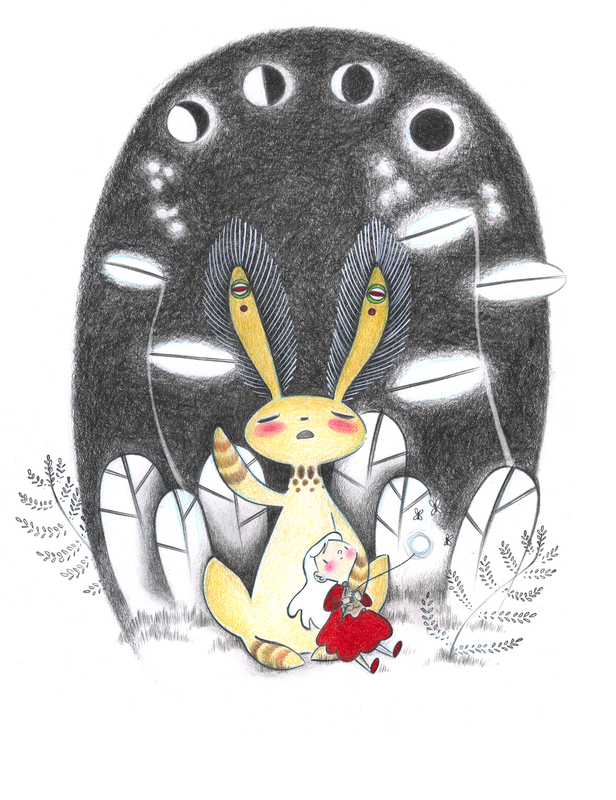 Marsha has shared some of her wonderful illustrations, sprinkled throughout this interview. Welcome Marsha, we're happy to get to know you better. Where did you grow up, and did that place (or those places) shape your illustrating? If so, how? My hometown and the place where I most identify with is Hockley Texas, not to be confused with Hockley County. For those of you whose idea of a town is a city center with a post office and possibly a courthouse, you’re get’n fancy. Hockley, when I was young, was not like that at all. It’s what you would call “unincorporated”. Imagine country roads, some of which were graded with iron ore, meandering off to who knows where, cutting through corn fields, cow pastures and rice paddies. I lived for seventeen years on one of those red dirt roads next to a corn field and cow pasture. There were few trees and lots of open land and sky. I spent most of my time playing outside, exploring and marveling at the beauty of my surroundings. As I grew up and my artistic tastes developed, my mom took me on art museum trips to Houston. The Menil has an expertly curated collection of paintings: this is where I first saw Color Field paintings by Mark Rothko and Barnett Newman. Growing up in an area where the scenery is quite literally a huge Color Field, the bands of color being the sky, horizon and ground, I was in awe of these paintings. I love color! Great big swaths of color. I always wanted to be an artist, in fact in Kindergarten there was an assignment to create a life-size paper doll of yourself as an adult dressed up in your future profession. My paper doll was of course an artist, complete with beret and palette. 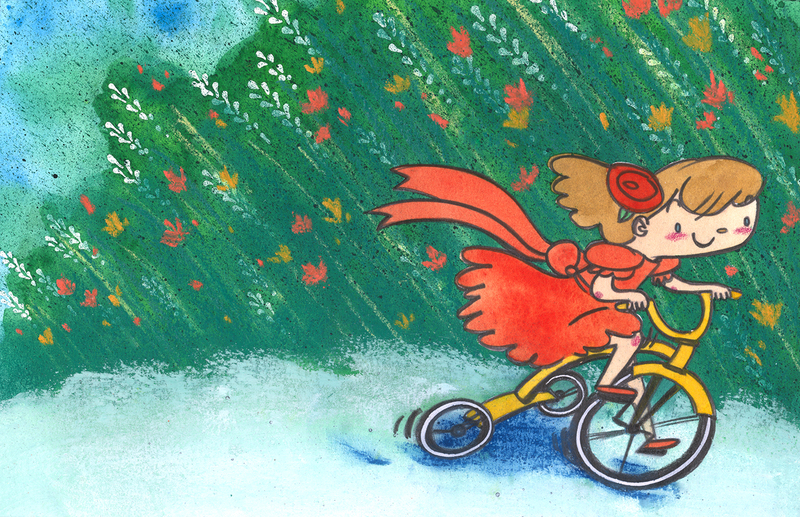 I fortunately don’t have to wear a beret while illustrating, which I’m sure would get sweaty and uncomfortable. I came to the profession of illustrating much later in life. 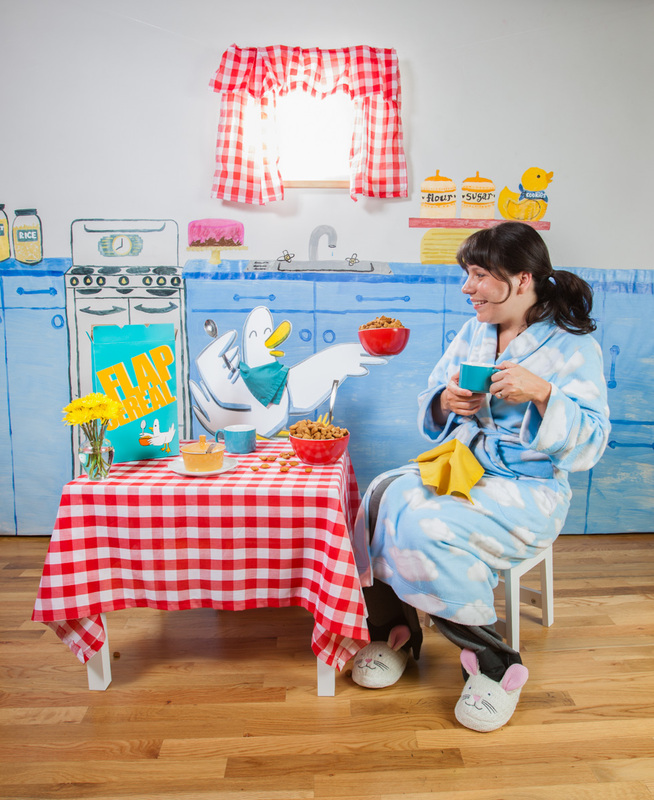 I was a graduate from The University of Texas in Austin and was trying out other career fields (installation artist, production ceramicist and animator) before realizing that children’s book illustration was a real passion of mine. Right now they would see me get up waaaay too late. I’m 23 weeks pregnant and I’ve been very sleepy — it’s almost like I’m growing a person or something… After I get up, shower and put on a proper outfit, I will not work in PJs (no offense to those that do). I go to my desk and look at my list of to-dos for the day (which I write up the night prior) and my list of weekly goals that I share with my friend and fellow illustrator Amy Farrier. I live my life by lists. Lists help me focus and center in on the most important things to do during my day. Depending on what my priorities are I do some of the following: draw or paint for a specific assignment, draw or paint for my own goals, respond to email or phone calls, run household and business errands, tend to social media for myself and The Girllustrators. Also, I do a lot of co-working which is where I either go to a friend’s house or they come to my house and we work on our own projects but in the same room. This can be a distraction but more often it’s a really great way to get feedback on work and inspiration for future projects. I usually co-work twice weekly from 12:00-6:00. At 6:00ish I make dinner with my husband Adam Norwood while listening to music, and we talk about the day and relax. My high school friend John-Michael Reed lives next door and we go over there to meet with friends a couple times a week for “porch time,” which before pregnancy involved a few glasses of wine. If we did not go next door for “porch time” and I had a deadline or was really inspired about a piece I was making before Adam came home I’d get back to illustration work till 11:00ish. Then I write a todo list for tomorrow, brush and floss teeth, wash face, watch Adam play the latest puzzle-ly Nintendo 3DS game, and pass out. I’ve structured my day like this because it’s the right balance for me. I need time to create and build my business, which I take very seriously. 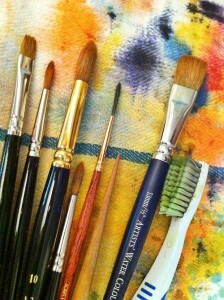 I also need time to relax and enjoy life and friends, which refills my creative well. Tell us about some of your accomplishments that make you proud (illustrating and/or otherwise). It’s hard to think of a specific accomplishment that makes me proud. I see my work and the goals I have as constantly shifting. As soon as I meet a goal I move that goal forward, so I’m never not working on improving. I don’t want to stop that momentum, and I feel that when I reflect on accomplishments I lose momentum. But I don’t want people to think I’m not happy with my work or anything else, I just don’t like feeling static. I know this sounds like a lot of pressure to put on myself, and it is. This is why I really need that time to relax and reconnect with friends at the end of my day. What surprises you about the artist's life? I would not say surprised, but I am very aware now about how much business savvy illustrators need, and how you have to view your career in the long term. Your work is like a gift to your readers. When they open the pages of your books, what do you hope they find? I hope they find inspiration the same way I found inspiration in those Color Field paintings. I want to bring beauty and joy to people. Marsha Riti previously illustrated a picture book, The Picky Little Witch, for Pelican Publishing, and is currently illustrating a chapter book series for Simon & Schuster, The Critter Club. She enjoys creating and experimenting with new ways of expressing herself visually. 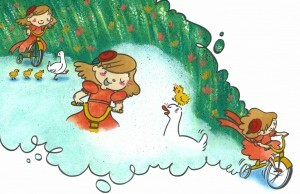 She also loves exploring and educating herself about the craft of writing, and is currently working on a couple of different book ideas, ranging from stories about a silly duck to a dreamy book about the moon. Marsha graduated from the University of Texas with a BFA in studio art. 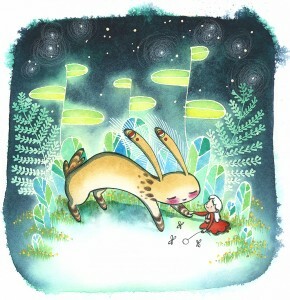 She has been a member of SCBWI for a number of years, and is also a co-founder and member of a female illustrator collective called the Girllustrators. She is represented by Teresa Kietlinksi of Prospect Agency.